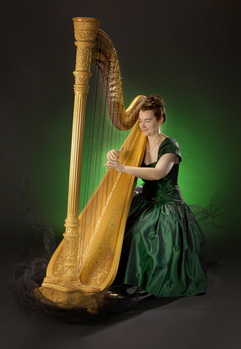 Enjoy the grace and elegance of harp music at your special occasion. Adrienne is uniquely positioned to help coordinate music for your special event. Her musical styles fit well with a wide array of special occasions including wedding ceremonies, receptions, anniversaries, corporate events and Christmas parties. Allow Adrienne to entertain you and your guests on her full size pedal harp with a broad range of musical styles ranging from classical, popular, contemporary and celtic music. Adrienne works with her clients to tailor her music to fit your special event.